A search is beginning for a new promoter to run Brecon Jazz after the Hay Festival organisation announced that it is pulling out. Brecon Jazz has suffered a number of financial difficulties, and the Hay Festival took over the running in 2009. But director Peter Florence said it would be concentrating on the Hay Festival's 25th anniversary in 2012. The Arts Council of Wales said funding would be available to other promoters willing to take over Brecon Jazz. Former Brecon mayor Martin Wheale said a jazz festival would go ahead between 10-12 August next year. Theatr Brycheiniog was a core venue in the new plans, he said, but there were other parties involved he declined to name. 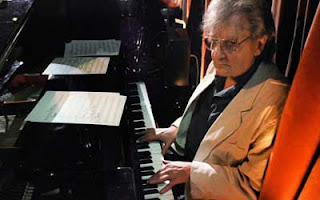 Stan Tracey has returned to Dylan Thomas for festive inspiration nearly fifty years after his seminal jazz suite based on Under Milk Wood. A new suite based on A Child's Christmas in Wales includes the veteran pianist's first compositions for more than ten years. A Child's Christmas Jazz Suite was recorded by Stan's current quartet, including son Clark on drums, with the addition of Stan's 21-year-old grandson Ben as narrator. "I've always had a particular fondness for A Child's Christmas in Wales because it evokes so many memories of the festival when I was a child," said Stan. "I was, therefore, delighted when Clark suggested that I should write something based on Dylan's story and wondered why I hadn't thought of it first. "I hope the music reflects some of the pleasure it has given me." The album is available on ReSteamed Records and is being performed in a series of Christmas dates around England. See www.stantracey.com for more details. If you're feeling festive, check out my Jazz Connection Christmas Special as heard on Radio Cardiff in recent years. I'm still on a break from live broadcasting but may return to the airwaves in 2012. In the meantime, please give your support to Rhys Phillips, Humie Webbe and everyone else playing jazzy sounds on Radio Cardiff. And look out for me whenever Wonderbrass, Gaudy Orde or Rogora Khart are playing in your area.